Andhra Pradesh is fast becoming a hot zone for development and progress. Major economic and infrastructure projects are coming up in the state after the bifurcation. Andhra Pradesh has been making major progress and there have been major developments across the board particularly in the Governance, Justice, Finance, Education and Knowledge, Health, Sports, Electronics, Media, and, Tourism sectors. A brand new city “Amravati” is being developed and built from the ground up to serve as the capital city for the state. This presents unique and incredible opportunities that are unprecedented in recent times. 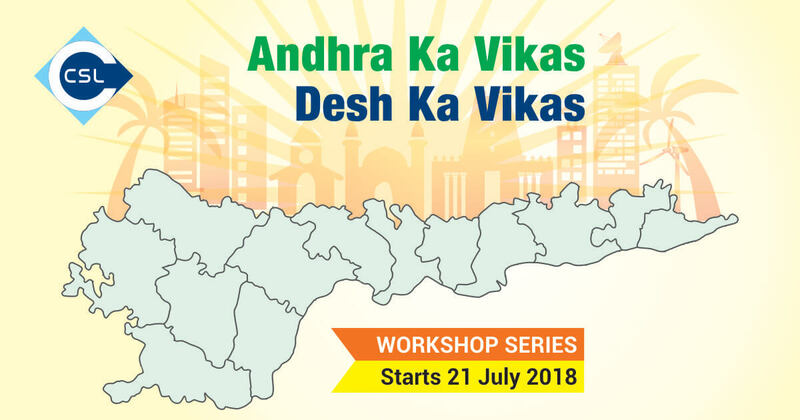 CSL presents a series of workshops titled “Andhra Ka Vikas, Desh Ka Vikas” – which delves deep into the importance of Andhra Pradesh in present India, and, how development of Andhra Pradesh is Development of India. The workshop series will start from Saturday, July 21, 2018 and is spread across nine sectors, namely – Governance, Justice, Finance, Education & Knowledge, Health, Sports, Electronics, Media, and, Tourism.